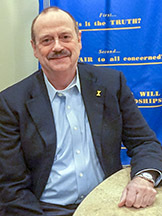 Rotary File for February 5, 2019 | Rotary Club of Iowa City A.M.
Dr. James Folk, UI School of Medicine, Opthalmology, and IDx Corp talked about automation's impact in improving productivity and accuracy in diagnosis of eye and other diseases. Best wishes to Roger Christian who is most likely facing further heart surgery. Hazel Seaba presented a draft list of the grants IC AM Rotary has given over the past 10 years to various groups in the area. She invited members to let her know if there are any corrections needed. She also encouraged members to fill out a survey on suggestions for future grants. Chris Knapp pointed out that there are three types of grant programs that we participate in: Global Grants through RI, Community Grants that we select locally from non-profit projects, and District Grants. Jim Peterson mentioned that the next Grant Management Seminar will take place next Saturday starting at 8:30 am. in West Liberty. Our club needs at least one representative in order to apply for any District or Global grant. Grant submission for the District Grants has a June 1 deadline. This is Peace and Conflict Resolution Month in RI's calendar. The Club's 30th Anniversary celebration will take place the evening of Thursday, Feb 21, 5:30 pm at the Kirkwood Room. Sign up. Monday, April 1 will be the next World Mini Golf challenge at Colonial Lanes. Sign up in teams of 2 this time. The fundraiser starts at 5:15 and goes to 6:30 pm and replaces our Month Opener for the month. Happy Buck highlights: Elaine Shalla and John Ockenfels are glad they were able to get the IA MOST team off from the Des Moines Airport. The team arrived only a day and a half late having to fight their way through bad weather and the Atlanta Airport during Superbowl Week. Myrene Hoover and Sue Cronin are both just back from Hawaii. Dr. James Folk, MD, is a member of the Ophthalmology faculty at the University of Iowa School of Medicine and Chairman of the Board of IDx Technologies, Inc. IDx is in the forefront of technology companies providing ways to automate areas of health care in order to improve on diagnosis accuracy, speed and cost. Folk noted that while national productivity as a whole has improved, in health care productivity has gone down in recent years. AI, or pattern recognition, is beginning to lead to improvements in disease diagnosis using non-specialist healthcare workers who have received just a few hours of training on how to take retinal photographs that can be interpreted through AI in order to diagnose for diseases such as diabetic retinopathy, and, eventually, for diseases such as macular degeneration, glaucoma, cardiovascular disease and even dementia and dermatological diseases. To date, IDx has received FDA approval for its diabetic retinopathy test which can be administered at primary care offices, pharmacies and even in non-medical locations. The automated test has been shown to be more accurate than diagnosis by manual means.